Home » B2B Lead Generation Strategies You Can’t Afford To Miss In 2018! You’ve Invested Huge Time in Identifying Your Audience, Brainstormed the Best and the Effective Lead Generation Marketing Strategize, And Attracted Traffic to Your Website. Just one thing that now determines whether your e-commerce business will be a huge success or miserable failure: Lead Generation & Profitable Conversions. Despite honest opinion, selling is not just a “number game”. At Nevpro, we often get inquiries from the clients that draw exceptional traffic to their websites yet their conversion rate is near to somber. Do you know one of the biggest challenges faced in B2B marketing? It lies in a word – LEAD. A lead is where it all begins. Without leads, the company would hold no clients, no revenues, no jobs and of course degradation in the brand value. Without leads, you’re nothing but “depressed”. Okay! So, Google, “how do I get b2b leads?” and you’ll end up with the below crap that’s really hard to imagine. No one wants to read: “10 ways to generate B2B leads”, “5 best B2B lead generation strategies”, “ tactics to instantly gain B2B leads” and so on. Where Does This B2B Leads Comes From? 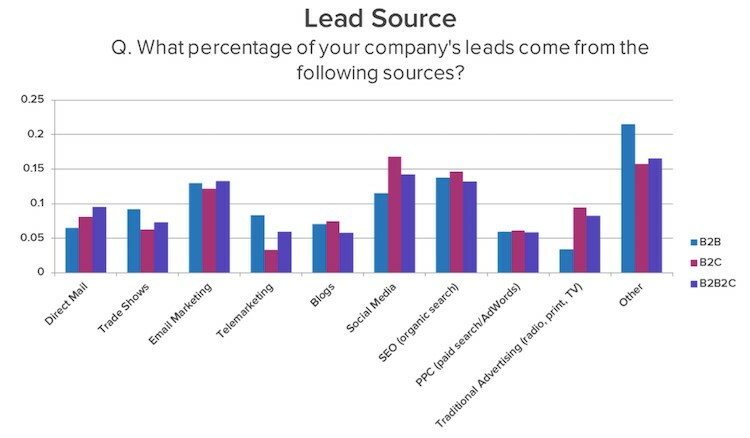 If you’re a Hubspot fan and would go with its study of the best B2B lead generation sources, we’d come to a conclusion that SEO is the best lead generation channel to grab more business. If, on the other hand, you’re supposed to go with Chief Marketer’s data, on the above question, we’d conclude that email marketing is one of the most effective channels to generate more leads. Needless to say, there are many similar surveys concluding social media and content marketing as one of the leading and the effective forms to generate B2B leads. Why So Much Of Variation? The likely answer to justify the question is AUDIENCE BIASES. It’s quite obvious that a survey conducted by an email marketing would definitely have different sets of results to the one conducted by PPC management tool as their audiences have different skillsets and biases that undoubtedly skews the results of the sample. So, in order to succeed, we should take specific ranking of different strategies into consideration just like a pinch of salt in food. Apart from these inconsistencies, many B2B marketers spend a huge amount of time to repair the acquisition cost. One of the leading reasons behind low results and conversions, I’ve found is landing pages, particularly your forms. Your form filters your leads from non-leads and has a huge impact on your conversion rates and the overall lead generation results. So, if you haven’t optimized your forms yet, I would strongly recommend optimizing your forms. Let’s say you send 1K visitors to your landing page at the cost of $2 per visit. If your form conversion rate is 1%, you’ll get 10 leads at the cost of $200 per lead. On the contrary, if your form conversion rate revolves around 3%, you’d have received 30 leads at a cost of $66.66 per lead. That’s 3x more leads with 1/3rd cost per lead and that too without even spending a single extra penny – Doesn’t this sound interesting? Well, this all can be achieved by optimizing your forms. Once your sales funnel is well optimized and you’re confident that there’s no more scope for improvement left, it’ time to acquire more traffic to your website. But wait, which channels should I use to generate more traffic ? 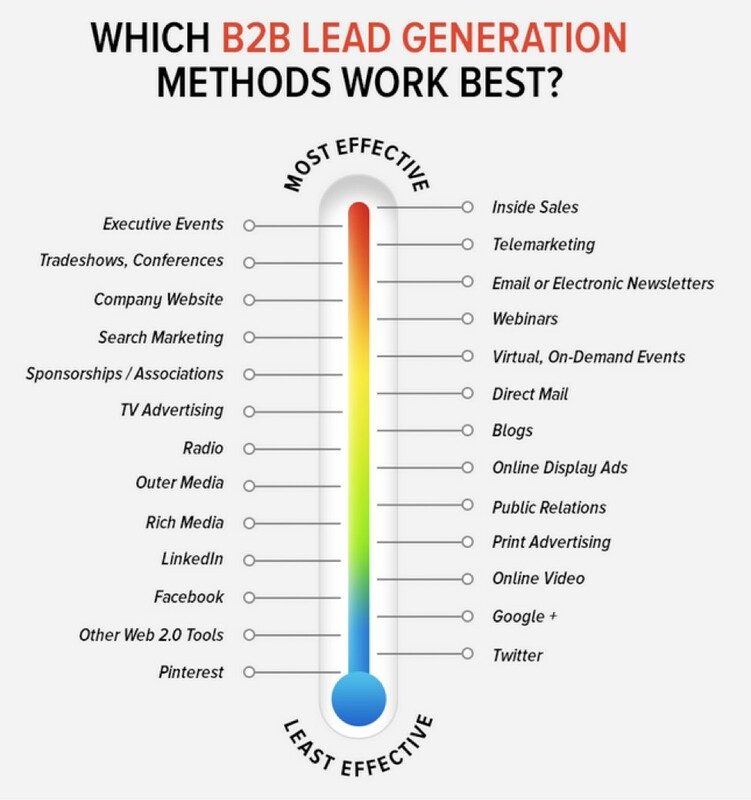 Okay, So, Which B2b Lead Generation Strategies Work? Generally, people say that social media acts as an effective tool for a b2b lead generation but, this isn’t the holy grain to generate profitable leads. Twitter Is Not That Effective! Why? “Twitter Is One Of The Most Effective And Strongest Social Media Channels To Generate More B2B Leads”. The article provided zero proofs and I’m more interested in facts rather than believing in the groundless claims made based on some research. 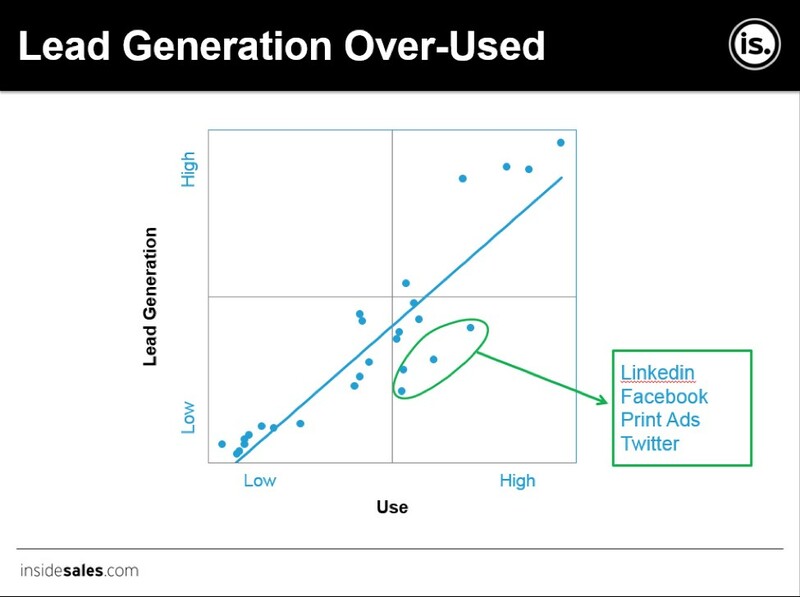 In accordance to InsideSales.com, it discovered that social media was low-effective but was highly used in lead generation technique. This is why social media is positioned at the bottom of the thermometer. So, How To Generate More Leads? Direct your social media visitors to your websites through multiple social media channels. Your social media visitor doesn’t constitute a lead and that is why you need to ensure that your social media visitors go to your website. In order to do that, provide multiple links to the website and landing page and capture them with email signups, free offers and lot more. 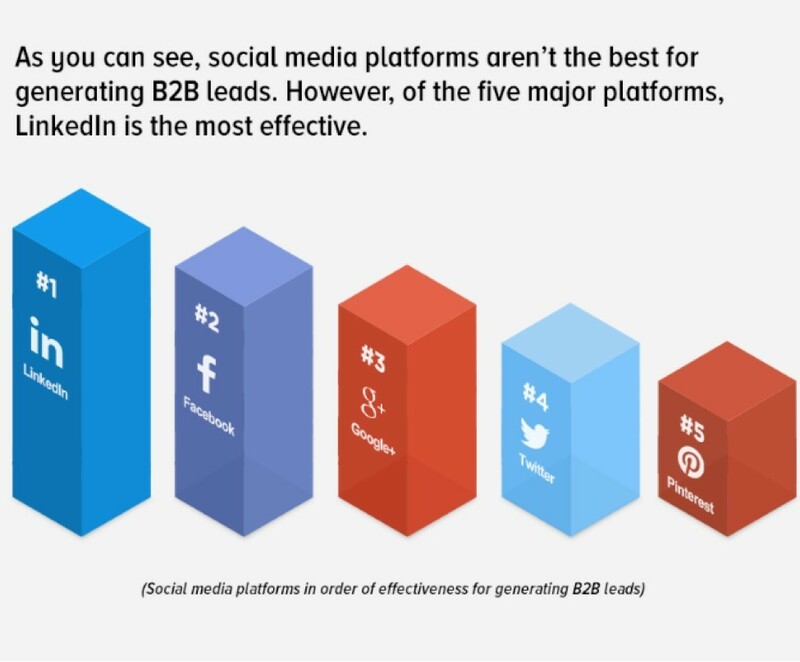 LinkedIn is one of the biggest social media platform for B2B lead generation value, The below Mediabistro’s visual image make this concept even clearer. Every social media presence requires a strong and robust account along with your availability. So, get online, start being active, connect with your colleagues and other industrial professionals. Ensure that your company’s presence is clear and your profile is distinct. 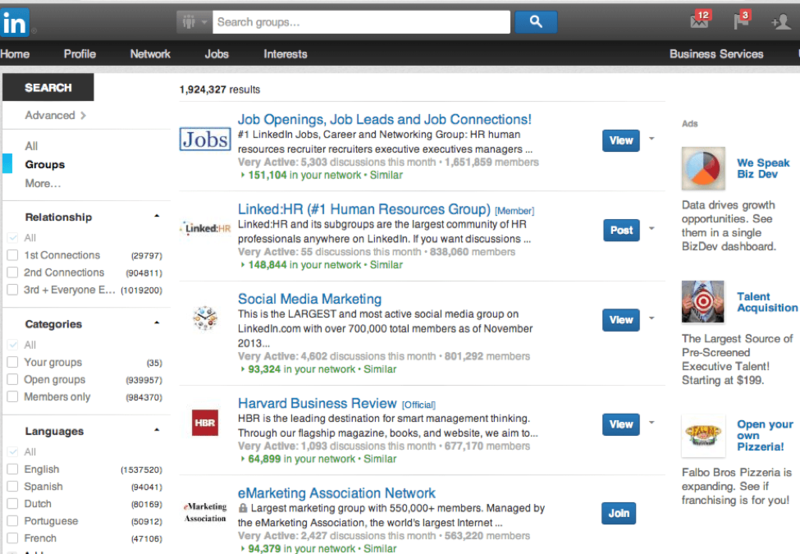 As LinkedIn hosts a huge variety of groups, find your alike group and connect with them that contain professionals that are likely to become leads. LinkedIn is all about people joining groups and discussing and talking about everything. Being active in this conversation means having a stronger marketing presence. If you want to go the direct route, LinkedIn has an integrated lead collection tool that helps to request a contact with the company and thereby generate warm leads. Create an ebook for your targeted markets. They’ll give you their email address in return. And voila, you have a lead! The idea behind the free tool is that they can be delivered instantly in exchange for email address which is a very important aspect of lead generation. But ensure that the free stuff is in digital format. Although Ebooks Are Most Popular, There’re Other Options Too! You can choose to give royalty-free photographs, beat tracks or whichever considerable item you have in your industry that you can offer for free. Marketing automation uses software to deliver the relevant content to a targeted audience that better help them to convert. They gather intelligence to track users behavior on social media account and then gain leads. This is how marketing automation works. Well, I believe in this: exceptional lead generation results comes from the willingness to constantly experiment with different tips and tactics and combine them across multiple channels. This experiment helps you to truly decide what works for your business and what doesn’t, and when you know this, you can surely use your time and budget more precisely to generate better lead generation results and high returns of the investments done. I hope this post has given you a brief idea of various tactics and possibilities with B2B lead generation along with the best focus area. 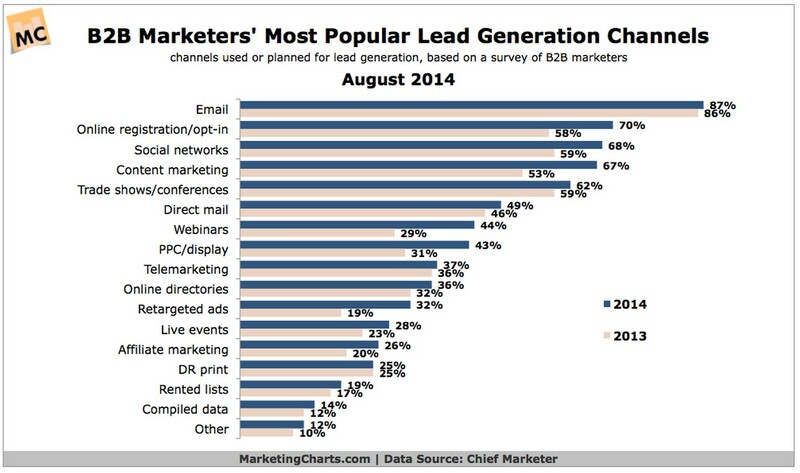 Which lead generation marketing strategies have helped you to gain more leads? Do let us know in the comments below. If you would like to write to Sanjeev mail at [email protected].